despite spending almost a decade as an editor and journalist for national magazines, the return policy on the C. Wonder receipt is probably my widest published and most-read “work” and therefore a highlight. 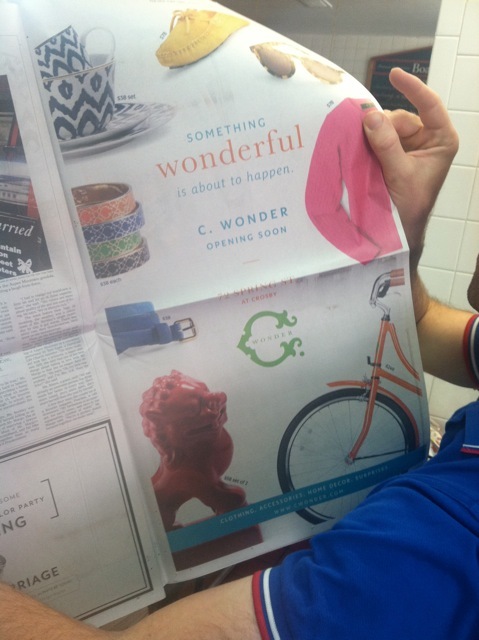 but opening the C. Wonder store last fall and seeing my work simultaneously splashed across The New York Times, taxis, tv and billboards was a crazy and memorable high. happier. just kidding. probably a zumba instructor or a d-list cable show tv host. <– not kidding. when i say i write a lot for C. Wonder, i mean i really do write it! 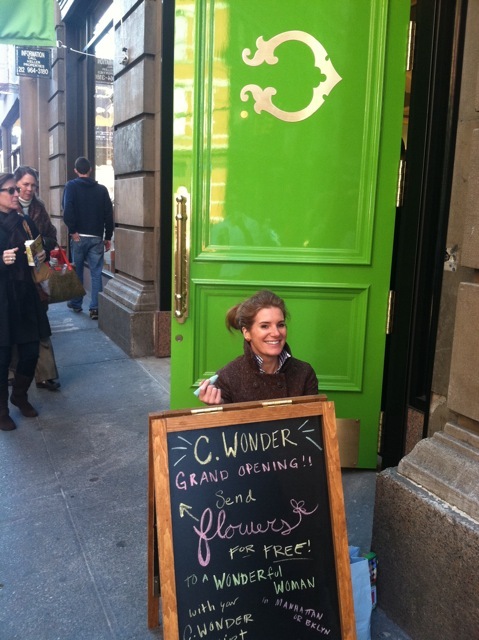 this is me on opening day of our soho flagship. i’m always delighted by the inventive copy penned by Kiosk, the soho (and online) shop. they tell funny, honest stories and never let fancy language hinder the message. it’s a remarkably effective sales technique. and Journelle. it’s hard to spin lingerie in a fresh way almost every day and they do it with elegance and verve. and i like the way Land of Nod and Boden include thoughtful messages on collateral like e-com packaging. my desk, which is rarely this neat, but always this colorful. our holiday 12 campaign included a buyout of spring st. station. i worked on the ads and wrote the “titles” of these small gift books. how meta! dropping teddy off at day care before work. our holiday 12 campaign included a buyout of spring st. station. This entry was posted in career advice, CL snapshot, creative inspiration, guest speakers, new york and tagged c. wonder, copywriting, monika chang, sophie donelson, the copy lab by thecopylab. Bookmark the permalink.